The Siberian river Lena is great and mighty. From sources on the western slope of Baikal mountains to ice cold Laptev sea its long way - 4270 km lies. On character of a current Lena divide into three sites: from a source to a mouth of Vitim, from a mouth of Vitim to a place of merge to Aldan and from a confluence of Aldan to a mouth with the branched out delta. On the top site Lena that roughly makes the way through abrupt rocky rocks slowly spreads wide lake on the hollows bordered with low woody hills. In first third of way, to a confluence of large inflow - the rivers Kirengi, Lena is rather shallow, and river biases are considerable. Only below a mouth of Vitim Lena becomes the deep river. The running Olekma still increases its power. Further the way of Lena throughout almost 600 km lies on a narrow valley. River coast - calcareous slopes frequently steeply going down to water. 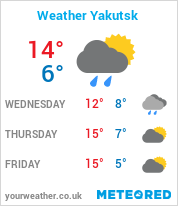 Approximately in 90 km above Yakutsk character of a current sharply varies. The valley extends to 25-30 km, Lena calms down and bears the waters smoothly and slowly, from the capricious mountain river does not remain also a trace. Such, quiet and stately, it approaches to Yakutsk and a powerful wide stream floats further, almost to a mouth. From lake Zholdonga prior to the beginning of delta coast of Lena are again narrowed. The deep, deep river makes the way to the sea between Haraulahsky mountains. The bottleneck, only two kilometres between coast, is located at Buluna. The river Lena delta surpasses in the sizes of delta of such rivers, as Volga or Nile. About 150 sleeves bear waters of Lena to the sea, constantly changing, as in a kaleidoscope, outlines of islands, lowlands, the lakes making delta of the river. Three channels are navigable - Oleneksky, Trofimovsky and Bykovsky, leading to port of Tiksi. On Lena the high spring high water, water rises to 10 metres, summer high waters more low. The water level in the bottom watercourse can have annual amplitude of fluctuation to 18 metres. What even in a high water of water of Lena are light and almost transparent is remarkable. To freeze Lena begins from a mouth upwards, and to thaw - on the contrary. Already by the end of October the mighty river is held down by ice. It will descend only by the end of May-beginning of June. Ice jams in a mouth - not a rarity. Terrible and gripping show! Almost on all extent the river is navigable, the truth, navigation on the river lasts not for long, only 4-5 months in a year. Industrial fishery is conducted - are obtained delicate salmon, omul, and also whitefish, burbot, taimen. In a mouth of Lena the Ust-Lensky reserve, two-piece - the Falcon and Deltoid is organised. The area of a protected zone makes more than one million hectares. The reserve territory in 2000 is switched on in the List of the World natural heritage of UNESCO. In spite of the fact that the reserve is located in high widths where coniferous trees usually do not grow, in him it is possible to see adapted to severe conditions of a permafrost a larch. In the north to identify it in an undersized bush creeping by the ground the expert can only, but in a southern part of reserve already there are groups of the trees reaching in height of three metres. Impresses summer abundance of the Arctic flowers, the multi-coloured dense carpet covers the earth, and not sunset sun feeds plants with light. The mistake of those who considers mountains and tundra of high widths lifeless and faded is great. The beauty of Arctic regions bewitches both in the winter, and in the summer.